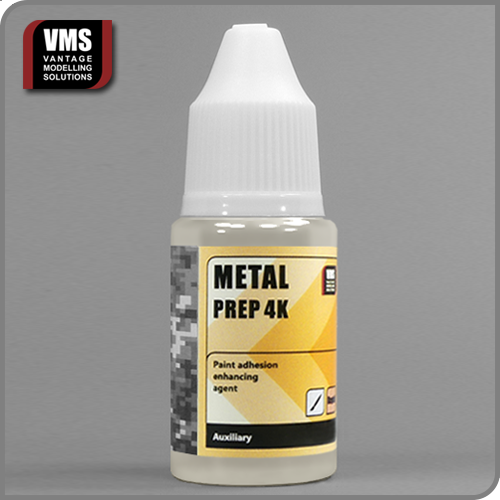 Metal Prep 4K is a primer for metal parts boosting paint adhesion and mitigating problems such as paint peeling at vulnerable areas, paint scuffing or general poor adhesion of acrylic paints. Paint coats preceded by Metal Prep 4K gain much desired durability. Product is applied with a brush to form a translucent and thin film which won't affect a model's detail. IMPORTANT: Please degrease metal parts with VMS Styrene Cement Standard Type prior application of the primer! Yippee! We blew right through these in our first shipment but this is now back in stock and just waiting for you to buy it.